Em will have the need for me to fix her clothes so they are more fitted, so I'm learning to fix things now. She is almost three and these jeans I bought her at 18 months, except for the length, they fit perfectly! To compensate for the length I wanted to add ruffles. I came across this button trim at Hobby Lobby, the final look popped into my head and I knew it would be super cute! 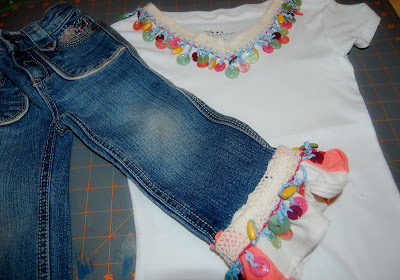 Click to read more about How to Make the Ruffle from an old T-Shirt and Matching T-Shirt (total cost of the project under $12). I bought this shirt from Target when she was about 18 months. I just loved the color! I cut the back of the shirt in half from top to bottom (2 strips). Then cut the strips in half (4 pieces). The sleeve I cut down the seam, then cut in half (2 strips). Then cut the strip in half (4 pieces). 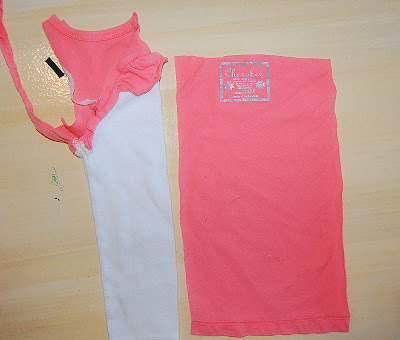 The 4 pieces (2 white and 2 peach/coral), measured about 24 inches total for a pant leg circumference that measured about 10 inches (the more material the more dramatic the ruffle). Then turn the edges over to top-stitch. Before sewing, get about 2 -3 inches of thread threaded through the machine and make a sizable knot at the end. Before cutting the thread, get another 2 -3 inches and make a knot at the end. 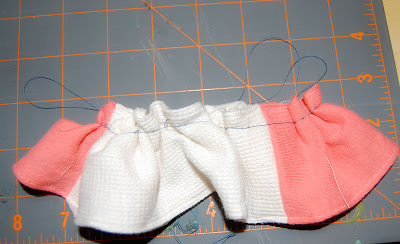 To make it ruffle, place the pant leg into the center of the ruffle, pull on one of the strings to get the width that you need. Once you have the width that you need tie the two strings together. 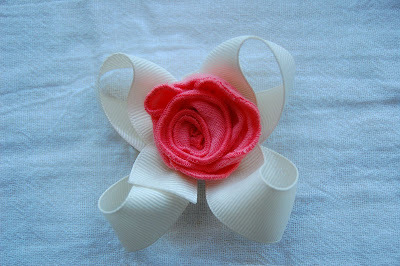 This will allow you to play with the ruffles to even them out, without messing up the width. 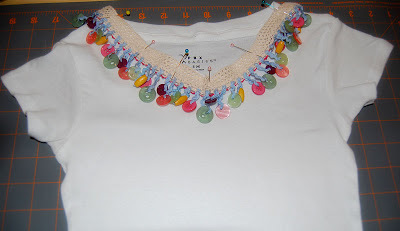 Now you can skip this step, but I just LOVED this button trim from Hobby Lobby! All I did was pin it on and did a zig-zag stitch. 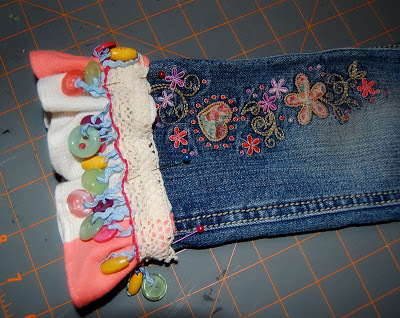 Then pin it onto the jeans and sew. I again used a zig zag stitch. I had some of the trim left over and a plain white t-shirt. So I pinned it on and zig-zag stitched it. Tah -dah! I LOVE this outfit and Em loves the buttons!...I even made a bow to go with it from part of the sleeve left over from the shirt, no sewing involved! The part of the sleeve already had a nice finished edge and the off-white bow came from a headband Em had when she was a baby. Em has a new outfit for under $12: 1 1/2 yard of trim was bought at Hobby Lobby when it was 50% and the t-shirt was under $4!